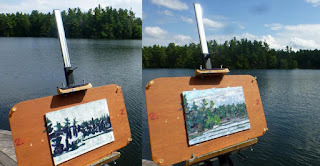 Phil Chadwick's Art: #1990 "Bass Lake Afternoon"
The Plein Air Painters Thousand Islands Region (PAPTIR) started and organized by Robert Hedden were having their August paint out close to Singleton Lake. Although I was just back from the Dumoine Art Camp, I felt I still needed to paint some more. I was still not wearing my reading glasses to paint and I didn't even notice that they were not with me after the Dumoine trip. I was down to my last panel from my canoe pack. This is a very rough piece of sealed masonite with a thin wash of white tint. I was painting on the coarse and textured side so there was little chance of including too much detail in the final painting even if I had been wearing my glasses. It was perfect for the plein air occasion. I liked the way that the pines of the forest stretched into the sky. This property is referred to as GleannaLea Refuge and it is indeed a sanctuary. All forms of wildlife share the property unmolested. Three large grey rat snakes live in the renovated barn. I tried not to step on the countless garter and Northern water snakes. There is even a power supply transformer that looks like a large black bear. Dragons and butterflies are also prevalent... it is indeed a paradise sanctuary akin to Claude Monet's garden at Giverny.